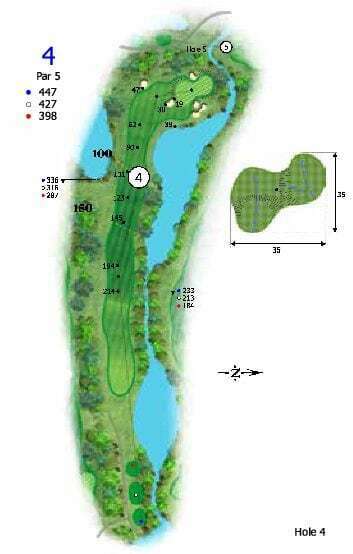 An accurate drive is required for the fourth hole which is a tight par 5 with water along the right and trees along the left. The decision from here will be either to lay up to a wide landing zone short of the lake, or take on the lake and bunkers which guard this challenging three tier green. Water is the dominant feature on this hole so play it safe if you want the best chance to make par. Safe Play: Keep your tee off down the left side of the fairway away from the water, then lay up to 100 meters out, leaving yourself with a short shot into a large green. Aggressive Play: Hit driver straight down the fairway, which will leave you a chance to go for the green with your second shot, hit across the water and miss the bunkers to set up a chance at eagle.